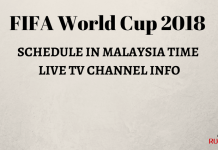 FIFA World Cup 2018 Live: The FIFA World Cup 2018 will live telecast in India on Sony Ten 2 tv channel. Sony Sports Network has bought the official broadcasting rights of all the FIFA events in India including FIFA World Cup 2018. Sony Sports Network is the exclusive Indian broadcaster of the mega football event. It is scheduled to take place from 14 June to 15 July 2018 in Russia. Here we will also take a look at all the FIFA World Cup 2018 tv channels broadcasting worldwide. A total of 32 teams who are divided into eight different groups will battle in the FIFA World Cup 2018. The tournament is one of the biggest sporting events which is scheduled to feature total 64 matches and set to be played at 12 venues in 11 cities of Russia. The final match will be held on 15 July in at the Luzhniki Stadium, Moscow. Sony Ten 2 and Sony Ten 3 tv channels will live telecast Fifa world cup 2018 in India. Sony has acquired the telecast rights of all FIFA events for Indian subcontinent and India till 2018 which also includes the world cup. Sony Pictures Network is India’s one of major sports channels for sporting events especially soccer. World cup 2018 will start from 14th June 2018 and ends on 15th July 2018 in Russia. You can check out the complete schedule pdf. As the per the even there are 32 teams are taking part in it which are divided into 8 Groups for 4 teams each. Top 2 teams from each group will qualify for knockout round of 16. Which Channel Will Provide Live Telecast Of FIFA World Cup 2018 In India? There are so many fans in India who are searching the answer for this question. Sony Ten 1, Sony Ten 2 or Ten 3 will broadcast all matches live on TV and even on their website on SonyLIV.com. Sony Pictures Network who is the official FIFA World Cup 2018 Indian broadcaster will show all the matches live telecast on SONY TEN 3 SD, SONY TEN 3 HD, SONY TEN 2 SD and SONY TEN 2 HD tv channels. Sony Network bought the broadcasting rights of all FIFA’s international events in 2014 for the 5 years for approximately $90 million. Sony Sports Network’s digital content partner sonyLiv will provide the FIFA World Cup 2018 live streaming in India. Football fans in India can watch FIFA World Cup 2018 live telecast on Sony Ten 2 with English commentary while Hindi commentary is available on Sony Ten 3 HD. Last time, Indian viewers have no choice but to watch the FIFA World Cup 2018 in odd time but this year, FIFA World Cup is taking place in Russia, so there will be no such issue. You can find 2018 FIFA World Cup schedule in IST here. The live streaming of the FIFA World Cup 2018 matches in India will be available on Sony LIV website and app. FIFA World Cup 2018 live telecast in India on Sony Ten 2/HD. India has a great passion for football and after the introduction of ISL, the country has witness increment in it. Sony Sports Network would have high hopes for FIFA World Cup 2018 in terms of viewership.